I'm lucky to be a Design Team member for the Paper Temptress, an online store that sells awesome & yummy papers and ribbon. 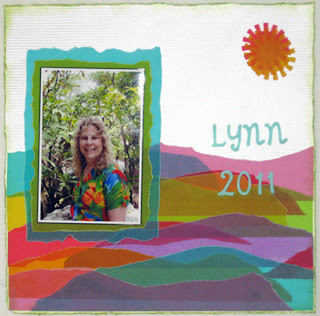 I wanted to design a 12"x12" scrapbook layout, highlighting some of that paper. So, I decided to play with colored vellum (and Lustre Laser Print paper). I encourage you to do the same! The technique is easy, fun and gorgeous. When you layer colored vellum, you end up with a whole new rainbow of color like the greens created from layering blues and yellows. Well, now we're talking my language... COLOR! My true passion in life! The colored vellum comes in 8.5"x11" paper, but for this technique, you're just tearing it anyway, so the length isn't important. It's very difficult to add adhesive to the back of vellum without it showing through since vellum is transparent. They sell several different vellum tapes, but I, personally, think they are all a waste of money. I use spray adhesive (outside in a well ventilated area). The spray covers the entire piece so it all looks the same. But, it tends to be very sticky, so you have to work fairly fast. To do this yourself, tear several different colors of vellum, leaving the straight edge on one of the sides. Tear the other side into a blunt point. You'll want to layer from the top down so that each new row will cover the bottom of the last row. Layout your design so that some of the straight edges are on the right and some are on the left. In other words, makes sure your design stretches to both sides. Try to pick up one sheet at a time to work with. Spray the piece and lay it down, carefully, towards the top of the page, lining up the straight edge with either the right or left side of the paper. Continue doing this with all of the rows and make sure the very bottom row is flush against the bottom edge. That's it! You'll end up with a gorgeous creation! I got to see this LO in person, and the translucent vellum has a beautiful, jewel-like effect! Great design work my fine and talented friend!